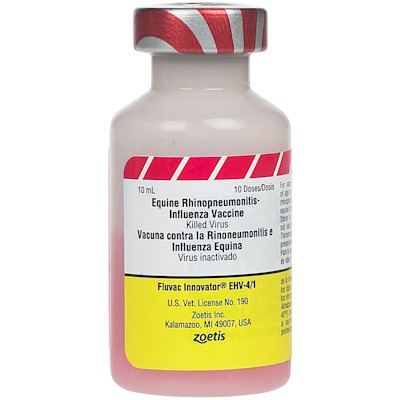 Fluvac Innovator EHV 4/1 (Zoetis) 10 dose vial is a killed virus vaccine that protects horses 9 months of age and older against EHV-4 and EHV-1 and influenza strains A1, A2, Prague 56, Ky '92, Ky '97 and also provides cross-protection against all other Flu strains. MetaStim adjuvant provides a more enhanced and a more rapid immune response. Give one 1 ml injection IM and repeat in 2 - 4 weeks. Revaccinate annually.